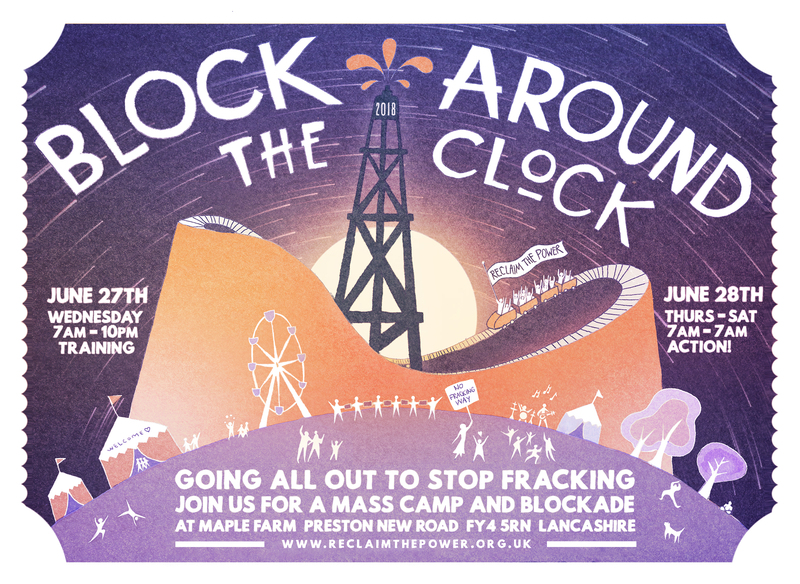 Rhizome likes both our action and our democracy direct, so we’re very happy to be supporting Reclaim the Power’s blockade against fracking at Preston New Road at the end of June. The Block around the Clock programme has a great line up of speakers, workshops and activities to get you inspired, informed and ready for action. Rhizome is running a number of workshops between 28-30th June, on building resilient groups, avoiding burnout, power dynamics, decision-making and dealing with confrontation. Grab your friends, your dancing shoes and a helping of defiance and **ROCK ON DOWN** to Preston New Road, Lancashire this summer for a people-powered ‘Block Around the Clock’! Time and again, local communities have shown the fossil fuel industry it has no social licence to frack in the UK. But Westminster won’t listen and, the government are continuing their plan to force this dirty drilling on communities. Over the next three months, Lancashire anti-fracking groups are organising a United Resistance of Love and Defiance to counter Cuadrilla’s dangerous fracking plans at Preston New Road. In June Reclaim the Power is joining the resistance once more and going all out to stop fracking. For 48 hours we’ll be holding the frontline against fracking. In our hundreds and thousands, we’ll be Preventing work from happening with our presence and sending a clear message to the frackers they are not welcome – not here, not anywhere. We’re bringing our bodies, our love and our creativity back to Preston New Road this summer. To make it happen we’ll need everyone’s talents, skills, energy and resolve. We’re calling on everyone who opposes fracking in the UK to join us at our camp and Block Around the Clock mass action (Facebook event) – as we say NO to extreme energy. Not in Lancashire. Not anywhere. We need a clean fair future powered by renewables. Everyone is welcome, especially if you’ve never been involved in anything like this before. Our camp will provide food, friends to be made and a whole programme of trainings, workshops, talks and events to get informed, engaged and skilled up to take on the fossil fuel industry. In short, everything you need to be part of stopping fracking and enjoy yourself at the same time! We’d love you to come camp with us, but if you can’t do drop by for a day visit. The final showdown of the United Resistance and an epic 3 months of action, it’s time to get up, get down, and show Cuadrilla what we’re about. Let’s Block. Around. The Clock. BUILD THE MOVEMENT FOR CLIMATE JUSTICE! Spread the word and invite your friends or share our facebook event for Block Around the Clock. If you would like to get more people involved, we can support you to put on a screening of Power Trip, the awesome new documentary about the people powered resistance to fracking in the UK. Send us an email at info@reclaimthepower.org.uk to get started. The fracking industry is on the ropes. Cuadrilla is now a full year behind schedule. Bring your friends, family, lovers and pets and let’s show them once more that we won’t rest until the industry is dead and buried. See Reclaim the Power’s website for more info or Frack Off for info about fracking near you and the resistance.